Wordchamp finally closed down at the end of 2013, after an announcement in April that closure was imminent. Registered users were able to download vocabulary lists they had contributed and most of my own are now available again on the CRAM site, though with reduced functionality. The Wordchamp site is now shuttered, though the database has been preserved, including the glosses which I added over six years for the Latin news bulletins from Finnish radio, and hopefully may one day again be made publicly available. I am leaving this page up in the meantime, providing an account of how the system was operating in its last year. Globalinguist's Wordchamp site, brainchild of the company's Chief Technical Officer, Daniel Blumenthal, has been an important feature of on-line language learning for almost nine years and, according to the site itself, has users in 217 countries, including 48,000 language teachers. The site was experiencing financial difficulties in 2011 and announced that it would close down at the end of the year unless a `strategic business partner' was found. However, thanks to appeals from many teachers, the company decided to keep the site open with a revised fee structure. Use of all the site's features now costs US$25 per year but students in grade 12 or below can access all of the learning facilities for free if they are enrolled in an on-line class set up by a fee-paying teacher. Use of the flashcards alone continues to be free for everyone. Flashcards: Even without registration on the site is is possible to search for and make use of flashcard sets already in the database. Registered users are able to create new sets, both by making entirely new cards and/or importing cards from existing sets. Although there are a number of other flashcard sites on the web (e.g. Ediscio). Wordchamp has the advantages of allowing you to see all the cards simultaneously when editing and providing a very easy method of adding audio by recording directly onto the company's own server. The system also allows the cards to be used for practice in several modes, including ones in which failure to type in a correct answer causes the card to be re-presented to the learner within the same practice session. Web Reader: Probably the most innovative feature of the site, this enables a user to read an on-line text whilst also viewing glosses stored in the site`s database, which pop up whenever the cursor is placed over an individual word. The databases, which now exists for a very large number of languages, include a certain amount of vocabulary entered by the site's own administrators for major languages, but, since the facility for individuals to add their own translations was added in 2006, they have become mostly user-generated. This has the dis-advantage, particularly apparent with the English glosses, that inexperienced learners may enter inaccurate information, or teachers enter information only relevant to one specific instance of a word's use and misleading in other contexts. It is, however, generally reliable for other languages, including Chinese, French and Latin. Reader have the choice of accessing another website via the Wordchamp one or of copying and pasting a block of text into the Reader page. I have myself been using this Web Reader regularly since 2007 to upload glosses for the vocabulary used in Finnish Radio's Latin news bulletins, on lines which I explain here. There are a number of other on-line facilities available to provide vocabulary assistance (e.g. nodictionaries.com) but my own method on Wordchamp is, as far as I know, the only one which provides translations for specific inflected forms rather than just giving the headword from a dictionary entry with or without a grammatical description of the word actually on the page (e.g. amabat is glossed as `he/she/it was loving.used to love' rather than `amo love'). In effect, I provide an inter-linear translation, with the reader only seeing this as and when he/she needs it for a particular word. There are the added advantages that I cover neo-Latin words that would not be found in ordinary dictionaries and also give extensive cultural background notes where appropriate. As well as contributing to the database in this way, I have also found the Reader particularly useful when trying to translate documents from Chinese or other languages of which I have only a limited knowledge. It is much safer to use glosses on individual words for this kind of job than to paste whole chunks of text into a programme like Google Translate, which can produce very inaccurate results when dealing with a language very different from English in its syntactic structure. WordChamp is one of the most amazing language tools I have ever come across. My students have never had an easier (or more enjoyable) time learning new words and conjugating verbs. They enjoy the website's instant feedback, its audio components, and its intuitive interface while I enjoy how easy it is to keep track of their progress. I truly love WordChamp's versatility. Flashcards can be set up to teach basically anything. My native speaker classes have benefited from a variety of exercises I've created specifically for them. Everything from tonic syllable identification, word syllabification and accentuation, sentence completion, cultural questions, and even listening comprehension questions can be set up via WordChamp. Thanks to WordChamp's easy importation system, transferring and adapting exercises to WordChamp has been a snap. As an added bonus, WordChamp allows me to save these exercises and utilize them for future classes. WordChamp has significantly reduced the time I spend grading and correcting papers. We cover significantly more material and students do substantially better academically. Hats off to WordChamp's creators! WordChamp is the most versatile, efficient, and popular online FL tool I have encountered in my 15 years of trying to successfully integrate technology into the teaching and learning of foreign languages. I particularly appreciate the interesting and demanding collaboration with the WordChamp staff: without question, a curious if not unique bunch of talented ‘computer geeks’, seriously and passionately dedicated to the student and teacher of foreign languages, to FL pedagogy in general, linguistic and cultural proficiency in particular, to today’s curricular demands, and - of course - technical efficacy. How can you not love a teaching resource that encourages students to become responsible and independent learners? I've been amazed and delighted at the lists and exercises my students have designed for themselves and their classmates with WordChamp. My students in Intermediate and Advanced French eagerly devote more time to vocabulary learning with less fatigue and higher retention than with any other method I've tried. WordChamp makes it easy to track progress — I can quickly see which words and expressions are still causing problems and target my lessons precisely to my students' needs. WordChamp is easy to use regardless of one's level of computer savvy. Wordchamp's unique ability to integrate seamlessly into our curriculum and offering portable technology to our students has set the linguistic bar even higher. Our students are energized by the prospect of improving their fluency from home and at school. Gone are the days of apathy among students 'forced' to take a second language. Now, we have students who are keen and ready to accept the new challenge. Wordchamp has provided me with the most incredible tool for measuring success. The course management tool allows me to offer tangible feedback to parents and administrators about the effectiveness of this online tool. Thank you to the Wordchamp team for bringing foreign language instruction into the new millenium! I am pleased to extend and share my experience in using wordchamp.com as one of my Swahili teaching resources. I started using WordChamp in January 2006 and have been amazed at how it has enabled students who had problems mastering Swahili vocabulary do so in a very short time. One of my students commented "WordChamp is the best thing that has happened to me in my many years of language learning". I also commend its hosts for the superb support they give language instructors. I have been using the WordChamp website since February of this year (2006). I initially began using it with my Year 10 students for just vocabulary revision, but now I also have them using it for listening practice for pronunciation, kanji revision & grammar, and I have also started my other year groups on it. It is extremely easy to use and the best aspect of the website is that you can make "sets" of flashcards, dividing them into themes or units of work (or whatever else suits your style of teaching). My students love using the website as it makes the repetitive aspect of vocabulary and kanji learning a lot more fun. With the "course management" section, I can keep track of who has and hasn't been doing the revision and it is so detailed you can even see what words students have had the most difficulty with. Another bonus is that students can make their own sets of flashcards and share them with others. The fact that the website is free for high school age students and below is absolutely amazing and if you have college-age students who have to pay for use of the website - it is well worth the money! I've been struggling for a long time to help students expand their vocabulary. I think that using WordChamp this year actually made a difference. They seem to respond well to assignments that give them instant feedback. As for me, I especially appreciate the wide choice of drill types and the whole audio component. Student comments from my first-year German course reflect the program’s versatility to accommodate different learning needs. Students particularly liked the audio recordings of each vocabulary item for practicing pronunciation. In addition to using the audio and testing resources, some students availed themselves of the extra features in the program such as the verb conjugation supplements. The reading sections with online access to annotated versions of German magazines helped make challenging authentic texts more accessible to the beginning learner. The ability to get an instant mouse-over translation of an unknown foreign-language word from any webpage is a fantastic learning tool that WordChamp makes available free to all language learners. In the past, however, I was often frustrated by new (to me) words that did not yet have an English translation available, particularly in the less commonly taught languages such as Portuguese. 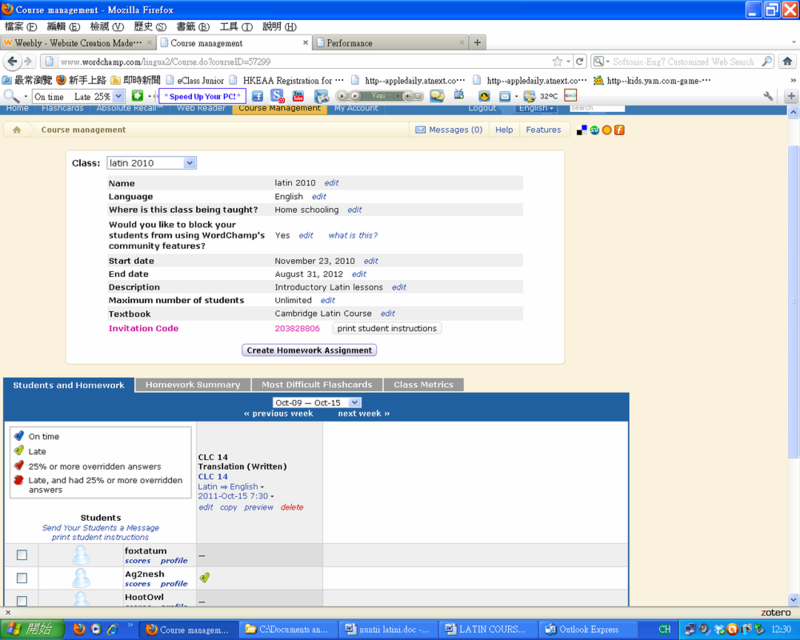 The latest version (October 2006) of WordChamp's web reader, however, now makes it possible for all users to add their own definitions that are then instantly available to all other users of the web reader. This provides great motivation for students to provide new definitions and for teachers to add them to target texts or create assignments in which students provide missing translations for a given text available on the web. But most importantly, allowing user translations should help to rapidly fill the remaining holes in WordChamp's already extensive dictionaries, making WordChamp's web reader an increasingly useful and indispensable resource for foreign language learners.